When you are in the market for a new or previously owned boat Mountain Cove Marina Watercraft is the place for you. We are dedicated to helping you enjoy your marine experience. We specialize in the sale, service, parts, and accessories for most boat brands. Thinking about selling your boat? People are amazed when we tell them how many boats we have consigned & sold. Give our extraordinary sales team a call today to learn more about our incredibly popular consignment program. For over 60 years, Crest pontoons have brought tens of thousands of Crest owners a tremendous waterborne experience that is based on one driving principle — PONTOON EXCELLENCE. Every Crest pontoon contains the DNA that has defined and evolved our watercraft, our brand, and our company for more than five decades. Today’s Crest is the freshest line up since the brand’s inception. At all trim levels, Crest offers an extreme level of American craftsmanship, quality, safety, style and comfort. Our new Calypso & Caliber models epitomize the Crest Experience. 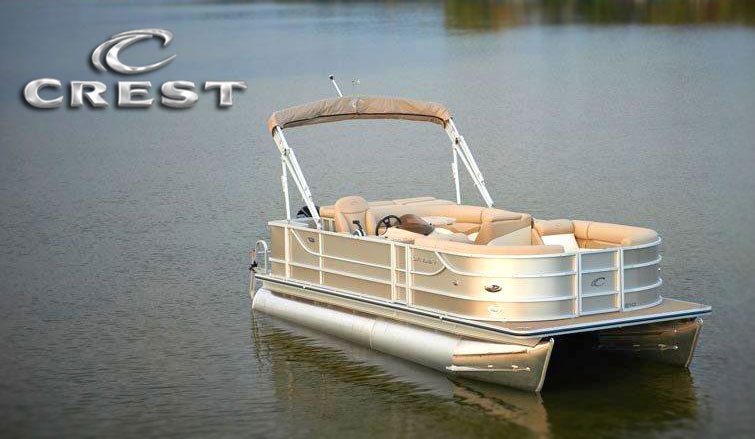 As you consider your new pontoon, consider the Crest Standard of Excellence and you will come to realize that Crest is the smart choice.